Summary: The 10th anniversary edition of the New York Times bestseller and international classic loved by millions of readers. I mentioned a few weeks ago that Khaled Hosseini has a new novel coming out in May called AND THE MOUNTAINS ECHOED. I can hardly wait!!! I can't remember the last time I was this excited about a new release -- I'm doing my own little countdown! All this talk of AND THE MOUNTAINS ECHOED has made me remember the first time I fell in love with Mr. Hosseini's writing. It's been almost ten years since I read THE KITE RUNNER. (You read that correctly -- ten years!) THE KITE RUNNER changed my world and I think that's a pretty good indication about the power of this book. To celebrate the tenth year anniversary, the publisher has reissued THE KITE RUNNER in a special 10th Anniversary edition. 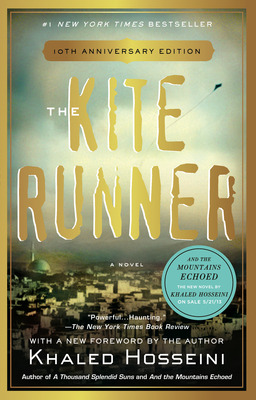 If you are like me and want to read THE KITE RUNNER again (or maybe you've haven't had a chance to read this book yet? ), here's your chance! Thanks for the contest - can you believe I've never read this book? I could just barely stomach the movie...probably won't be reading the book. I haven't read this book either - so thanks for the giveaway!